This enables 3D sound positioning in-game. You'll hear exactly from which direction a sound is coming from. 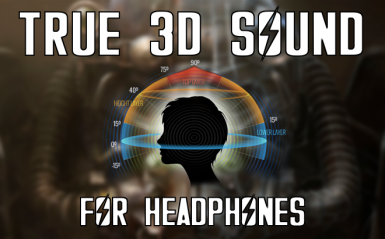 This mod enables true 3D sound for Fallout 4 by using a so called HRTF to simulate binaural hearing using normal stereo headphones. You will hear exactly from which direction a sound is coming from. 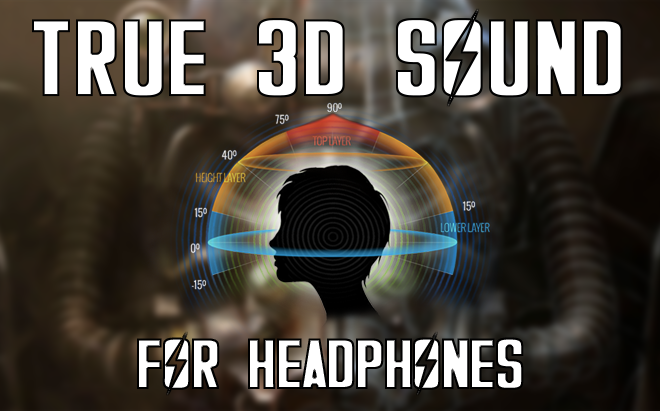 This mod will give you an advantage over regular surround headphones by simulating how real physical sound is perceived by your brain through a HRTF. Something normal surround like 7.1 can't do is sound that comes from above or below. DO NOT USE ANY MOD MANAGER TO INSTALL THIS! COPY THE FILES MANUALLY. Launch the game and enjoy! It is recommended to disable any other surround sound features of your headset or soundcard. You will only get the desired effect if you use headphones! If you have surround headphones (5.1/7.1) make sure you disable any surround processing. Two channels (stereo) are sufficient for this mod to work. Any further surround processing will distort the effect. You have to make sure that you have Visual C++ Redistributable for Visual Studio 2015 (the x64 version) installed. Remove the files from the Fallout 4 installation directory. All credit goes to kosumosu. He gave me permission to upload his mod on this site.